How do I get the best value for money? That’s a question asked not only by MediaMarkt’s customers when they buy consumer electronics, but also by the strategists in MediaMarkt’s marketing team when it comes to placing creative television advertising. That said, while it is possible to express most consumers’ wishes in terms of megahertz or megapixels, in revolutions per minute or dots per inch, marketers have so far lacked a metric that reliably captures the quality of medial environments. Developed by conoscenti and used by the MediaMarkt team as part of a pilot project for fine-tuning its media planning, the Media Quality Score (MQS®) closes this gap (find out more). In February 2016, MediaMarkt launched its MediaMarkt Club. The focus is not only on price and discount offers, but also on creating customer-specific added value with many instant benefits, selected national and local services, along with club-specific campaigns and events. The club’s declared aim is to establish itself within a few years as the retail sector’s largest customer loyalty program. In order to increase awareness of the club, MediaMarkt is also relying on TV adverts. In 2016, actor Sascha Hehn advertised the sparkling moments that the club gifts its members, from instant wins at the checkout to exclusive sports events. In addition to the 30-second main ad, a 10-second advertisement was shot featuring a competition aimed at activating potential members. Together with conoscenti, MediaMarkt developed for the MediaMarkt Club a tailored composite performance indicator comprising multiple components, including awareness of the club, familiarity of the audience with its benefits, and not least membership. Taking these indicators as a basis, conoscenti determined in an experimental approach with more than 1,000 active participants from the media target group the impact of the advertisement for roughly 400 formats and 20,000 individual programs of the 10 most important television channels. Each environment was allocated a value, the Media Quality Score. MQS® measures an environment’s performance relative to the average for all examined programs (100 points). Findings: Performance is highly dependent on the specific environment. For instance, the advertisement had a far greater impact on the audience of reality formats like “Goodbye Deutschland!” (MQS® over 150) than on viewers of sitcoms like “Two and a Half Men” (MQS® below 50), despite the fact that there are barely any demographic differences between the two audiences. As the ranking of environments by MQS® shows, the tested advertisement had a particularly good impact on viewers of reality TV formats. No less than five reality shows made the top ten: aside from “Goodbye Deutschland!”, the list also featured “Berlin Tag und Nacht”, “Shopping Queens”, “Anwälte der Toten”, and “Betrugsfälle”. 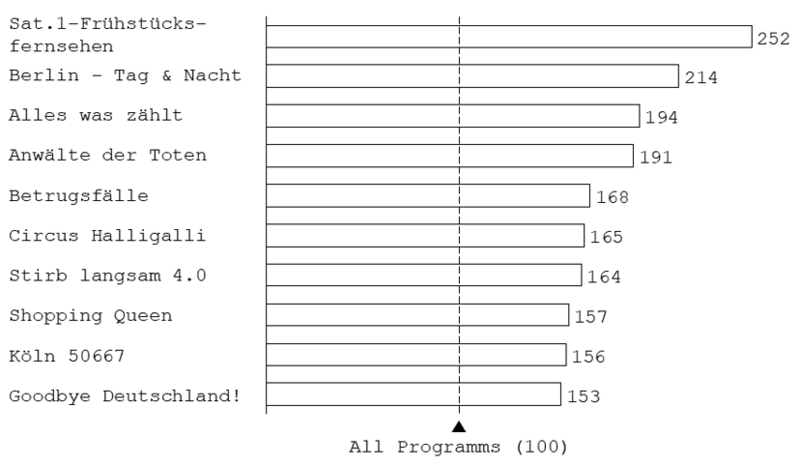 In the environment of the series “Berlin Tag und Nacht” (generally considered scripted reality), the MediaMarkt advertisement even performs twice as well as the average for all programs assessed. Such insights are extremely valuable. Assuming rigorous placement in environments with above-average resonance, the imputed increase in impact comes to 19 percent measured by the club-specific performance-indicator: more awareness, more interest, and more potential members for the same money. MQS® can be used not just for common media types – from TV and Radio to print and online – but also for a broad range of tailored advertising objectives. With customer-specific impact measurement and environment optimization, conoscenti supports companies across all industries in boosting the advertising impact of their media budget.